It's A Wrap! The Truly Myrtle July Knit Along! Wow! What a month! July buzzed passed in a blur of gorgeous shawls and hats! I was completely blown away by how many people joined in the knit along over in the Truly Myrtle Ravelry group! I was thrilled to hear lots of you say that you've learnt things during the kal. I know that some of you learnt about lifelines, beading, following charts and blocking. That is just fantastic and it makes me really happy. I was also pretty chuffed at how many of you took up the challenge to post modelled shots. It's a bit scary putting photos of ourselves online but isn't it great to see how everyone styles their shawls? I love it. I wanted to also say a huge huge thank you to all the generous people that donated prizes for the kal. We had 15 fabulous prizes to give away. So THANK YOU! If you're curious about who won what (or if you won!) pop over to the Ravelry thread and take a peek. In the meantime, keep on chatting over there - it's been neat to get to know you a bit better. Happy knitting and THANK YOU! 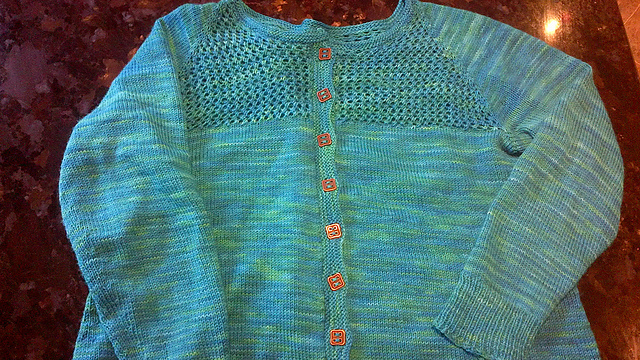 My Epistrophy Cardigan Is Finished! I may have been heard saying "roll on winter" after taking these photos. Of course I didn't really mean it, the summer is glorious - but I'm so thrilled that my cardigan is ready to wear and I know I'm going to live in it when the cold weather does eventually arrive. Epistropy is a lovely pattern and I love how mine has worked out but I think the overwhelmingly great thing about my particular cardigan is the perfect marriage of yarn and pattern. They were made for each other. You'll remember I used Outlaw Yarn's Vanitas DK? My initial impression was spot on. I'm pleased to say that it's soft, warm and delicious to wear. 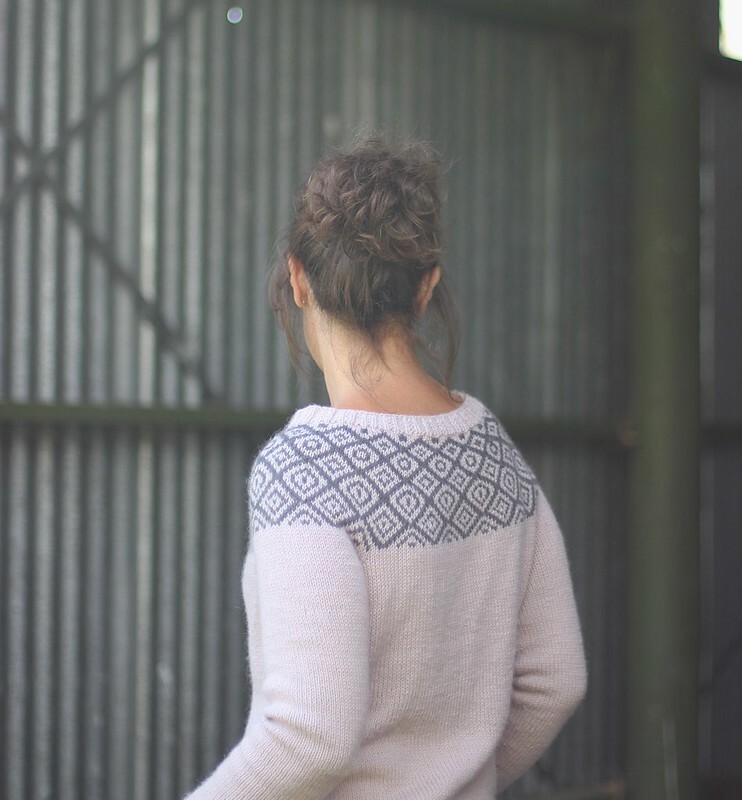 The halo of the alpaca gives it a rather ethereal look and the colour work knitted up beautifully. I think it'll settle into place even better over time. The pattern was good too. Of course I made nearly every mistake possible - but it was my rushing that was the cause of that rather than the pattern. It was well written and straightforward to follow. I really liked how the designer (Kate Davies) numbers each section in big bold text. It makes it easy to find your place again. The steeking wasn't too bad after all, once I got going. Did you catch it on Instagram? I made a little video when I cut it up the middle. I may have held my breath! The only thing I wasn't overly keen on was stitching on the ribbon to hide/secure the cut edge. I was worried that I'd bunch up the stitches and pucker the knitting. 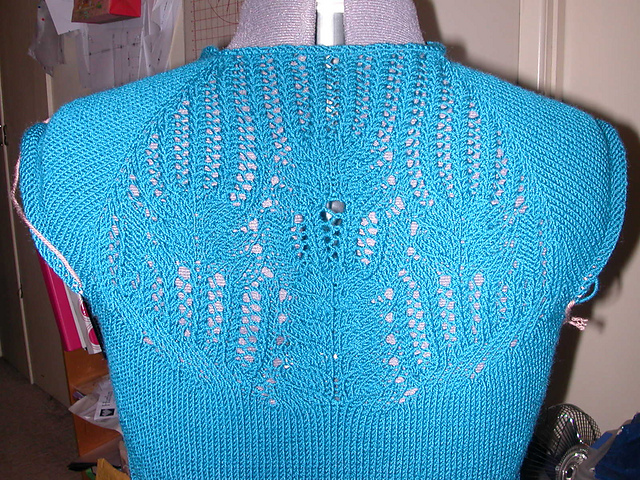 Fortunately that didn't happen, although it'll be interesting to see if the back of the cardigan droops over time in comparison to the front. It was a bit fiddly getting the ribbon flat, even and the same on both sides. I found it it easier to stitch on the ribbon when I laid my cardigan on the carpet and crouched down. The carpet held it in place so that it didn't wriggle around and everything stayed nice and flat. A very sharp needle helps slide through the ribbon too. To make the two sides the same length I lay the finished side next to the second side and tried to match them up. I used the tiniest stitches I could. Be prepared for the stitching to take quite a while! If I was to make one change I think I'd add a couple of inches to the sleeves. They just fit at the length suggested but I've realised that I tend to pull the top of the my sleeve up a bit and they could really manage being a bit longer. I think the whole sleeve length issue is one of the downsides of knitting sleeves bottom up rather than top down. 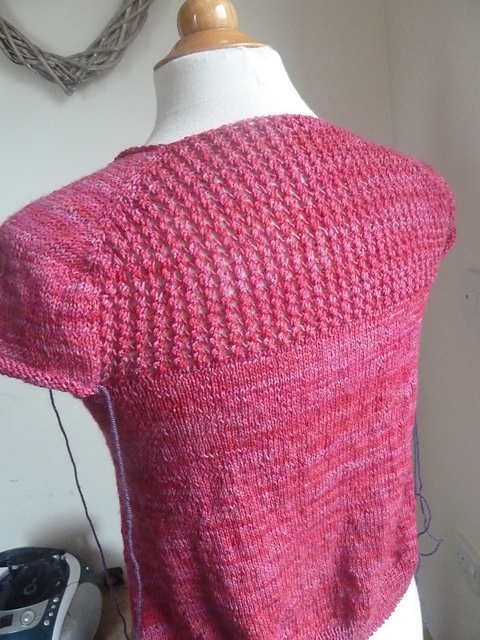 I toyed with the idea of adding a bit more length before I joined the yoke but decided not to after measuring my arms a bunch of times and deciding that it'd likely work ok at the length suggested by the designer. Now I'm done, I can't easily go back and add length. I'm making an effort to update my Ravelry projects page this year. I've a few things that I haven't put up yet. 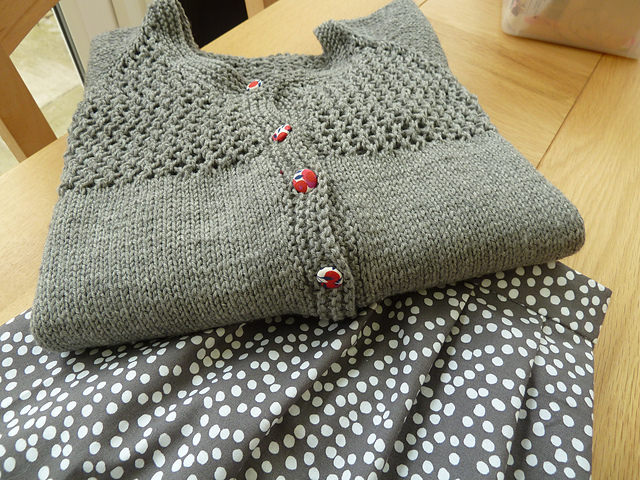 So, starting as I mean to go on, my Ravelry page for my Epistrophy cardigan is here. P.P.S. If you fancy joining in a very casual Pomme de Pin cardigan KAL, come and find us on Instagram by searching the tag #pommedepinkal. 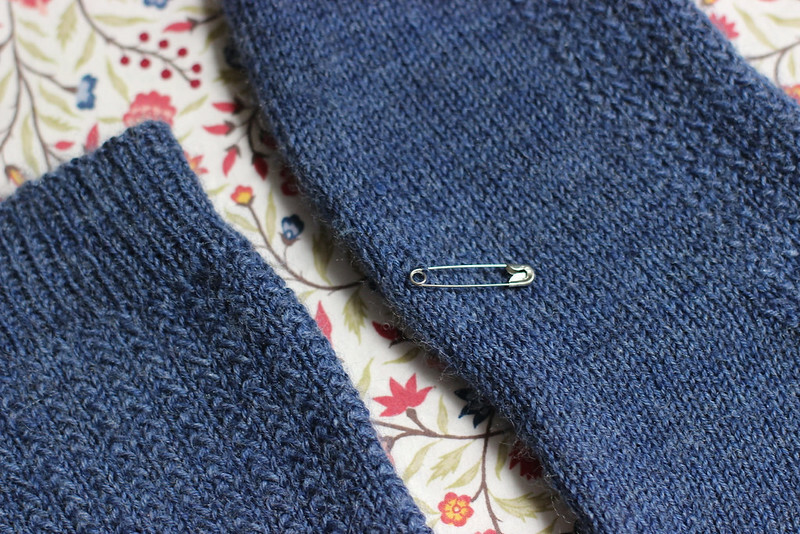 You're welcome to join in whether you're just starting a brand new project or have a half-finished cardigan tucked away. There it is, the cheeky monkey. I wondered why my stitch count was off when I reached the toe. When I laid them out to block I spied the stitch that escaped. He's been caught him with a safety pin and I'll deal with him shortly. I think I'll work him down to the toe with a little crochet hook and then weave him away with a needle and yarn. 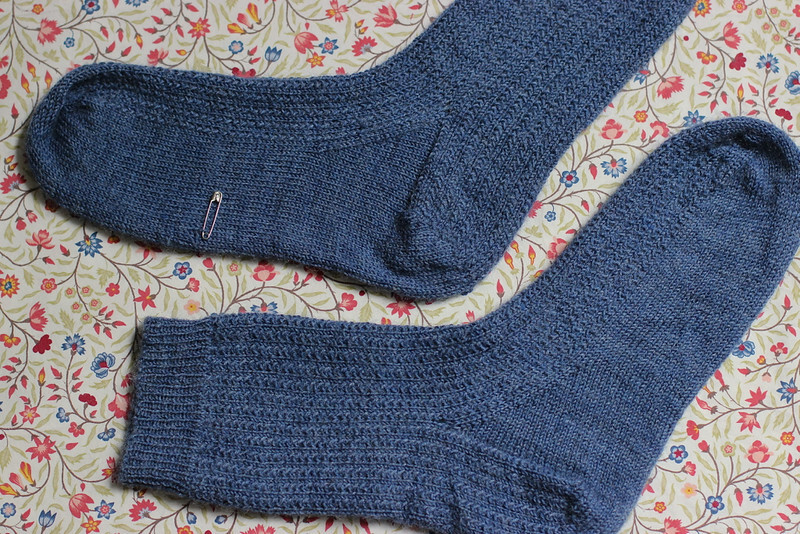 Have you finished your socks for Sezza's socks knit-along? My Ravelry project page is here. My fervour for knitting socks knows no bounds this week. I've cast on Sarah Ronchetti's Scott Base socks for Mr Myrtle and the pattern is quick, easy and sufficiently varied to hold my interest. I'm nipping along. For Mr Myrtle's socks I'm trying something new. 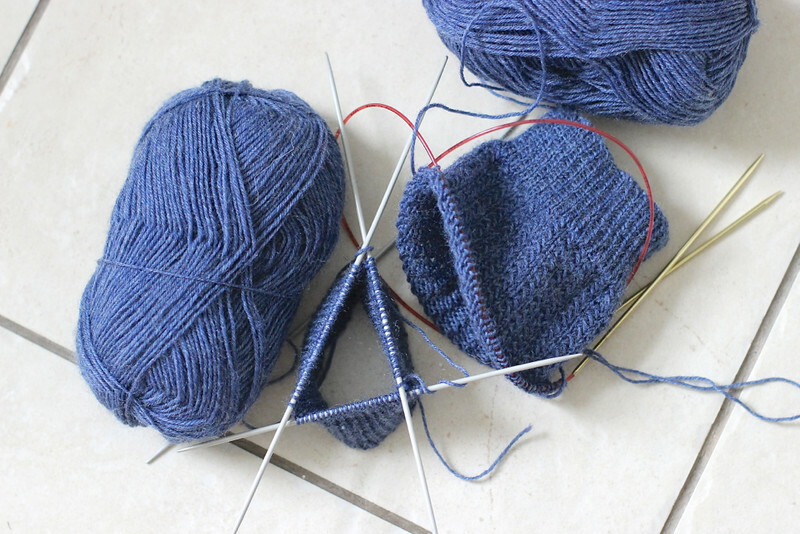 In an effort to combat the dreaded "second sock syndrome", where you happily knit the first sock then really can't bear the thought of casting on and knitting the second and all the fun goes out of your pair of socks, I am knitting my two socks at the same time. Well, sort of. I haven't quite figured out true "two-at-a-time", but know that it involves a circular needle. That'll be my next challenge. First, I'm having a go at "knit a bit of each" two-at-a-time sock knitting. I confess that the "knit a bit of each" approach wasn't my idea, but I think it's genius. I heard of it from Joeli on her new video podcast - Joeli's Kitchen. 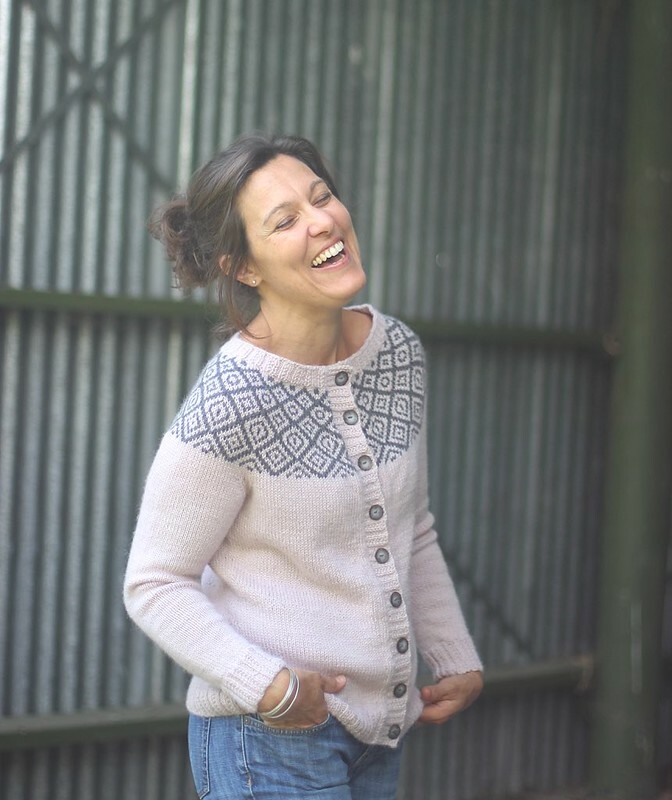 I'm enjoying her podcast and I suggest heading over her way if you're a knitting nerd like me. You'll likely learn something new too. So, are you joining in Sezza's knit-along? Have you cast on socks this week too? My Ravelry Project page for my knit-along socks is here. We made it to the end of the Truly Grace knit along and it was really fun. 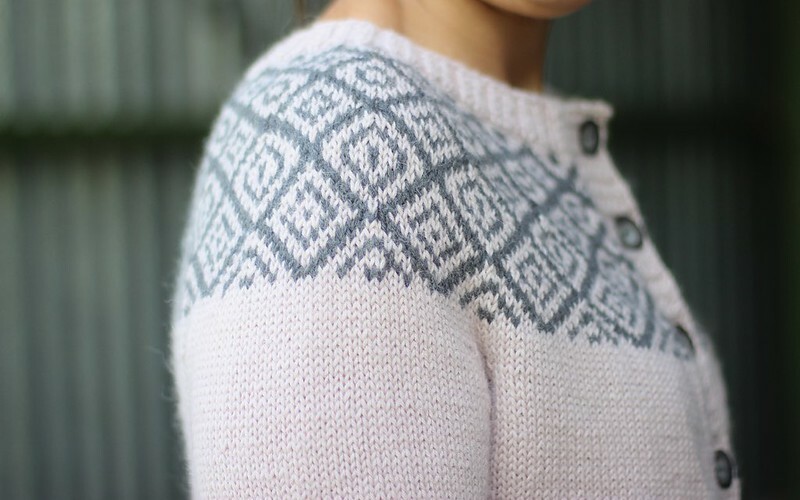 I was so pleased that so many of you decided to join me in knitting Jane Richmond's lovely pattern Grace, and I was very impressed at how fast some of you finished your cardigans! There are a few that are on the final straight (well, final arm ...) and with a bit of luck you'll be wearing them with pride really soon. 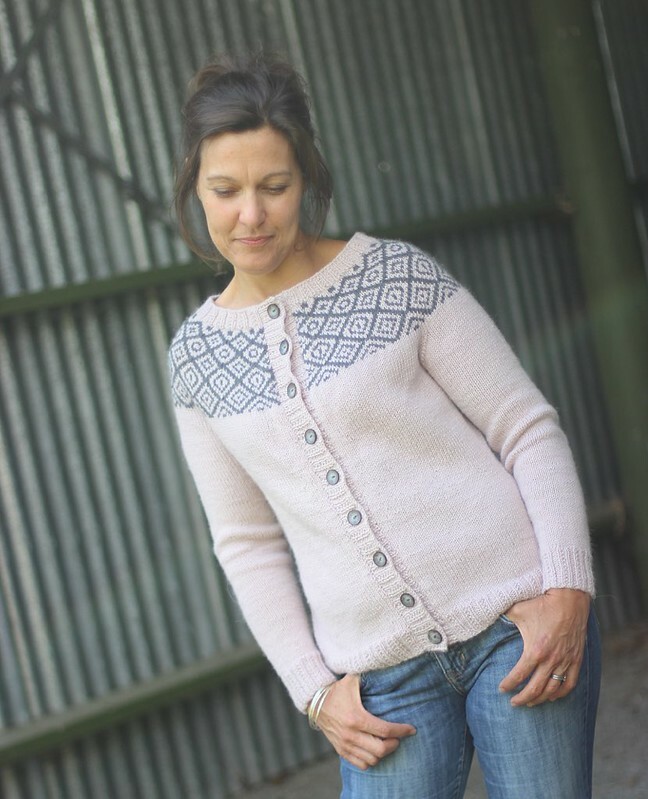 Before I announce the winner of the Grace knit along prize I thought it'd be fun to show you some of the lovely Grace cardigans from the knit along. Isn't it amazing?! I thought you'd be impressed! Righto - the draw. Thanks again to Jane Richmond and Sarah at my LYS The Sheep Shop for donating prizes. Drop me an email or a PM on Ravelry and let me know your address details, so I can post your prize. Thank you so much to everyone that joined in - I hope you had as much fun as me!